From epic cities to serene landscapes, make your next marathon not only a bucket list challenge, but one you’ll remember for a lifetime. And if running is not your thing, we’ve paired up each of these marathons with fantastic tours which include walking and hiking these epic places! 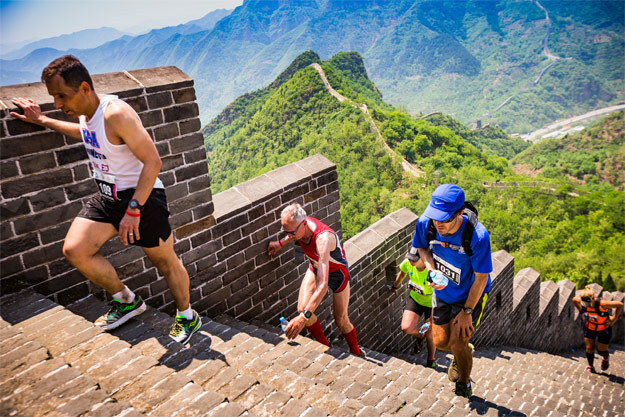 Coming up to its 18th year, the Great Wall Marathon is the ultimate marathon challenge. 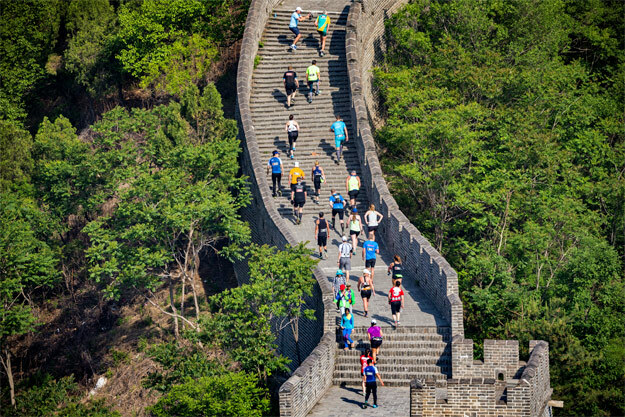 It’s widely recognised as the most gruelling of all the Asia marathons, where up to 3,000 runners will conquer the Great Wall’s 5,164 steps, reaching elevations of over 500 metres from the start line! 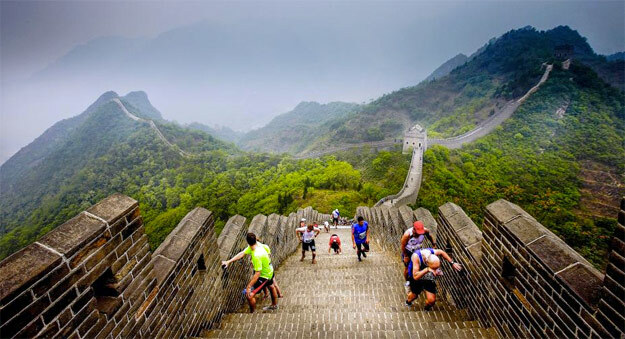 The route cruelly leads you to climb the Great Wall both at the start and at the end of the race, as well as traversing undulating hills and passing small villages along the way. Running on both restored sections of the Great Wall and the more picturesque parts which are now crumbly remnants of what once was, as well as dirt tracks through local villages, conquering the Great Wall Marathon is the ultimate victory of a lifetime. Experience sunset on the Simatai section of the Great Wall and trek for up to six hours from the Gubeikou to the Jinshanling section on our active A China Adventure escorted group tour. If you’ve booked a tour with us already, extend your China trip with a Great Wall Hike! One of the top marathons in the world, the Tokyo Marathon is the next event to try after running the London or New York equivalent. 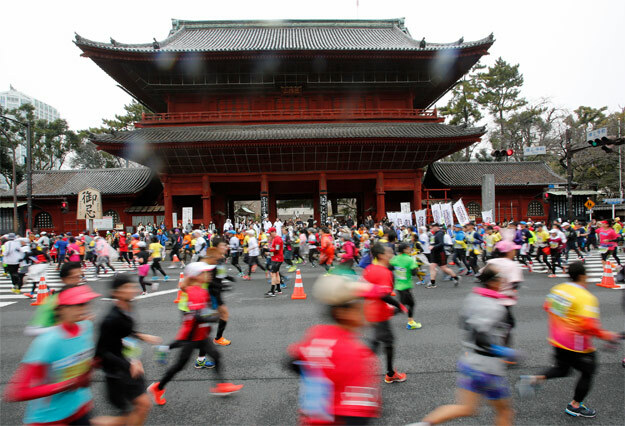 10,000 runners take to Tokyo’s famous streets to complete the course, passing through some of the cities most famous areas including Shinjuku, Asakusa and Ginza. It gives you the opportunity to experience both old and new, from the city’s awe-inspiring skyscrapers to its stunning Buddhist temples. 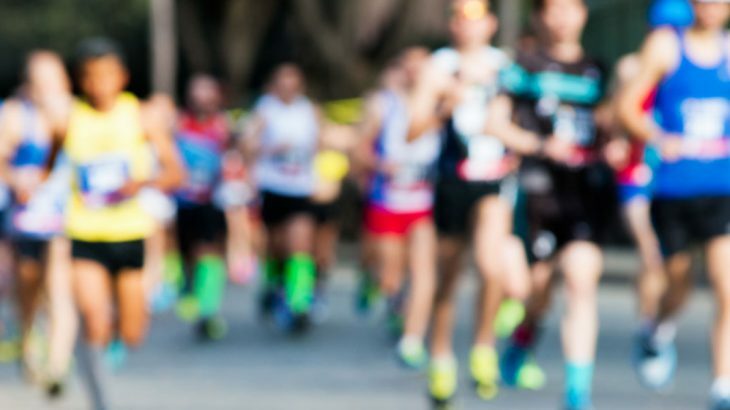 A flat route, it’s definitely less of a challenge than some of the marathons we have chosen, but it’s one of the most iconic Asia marathons nonetheless! 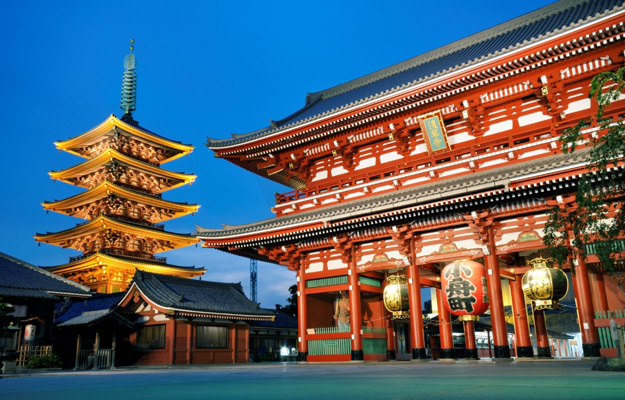 Witness the fusion of past and present when you explore Japan’s capital on our Trails of Japan escorted group tour. Experience traditional Sumo Wrestling, the crazy Robot Restaurant and try Japanese drumming in a Taiko class. Bagan is the jewel in Burma’s crown. Home to over 2,000 magnificent stupas, temples and crumbling pagodas, this marathon is not only a feast for the legs but one for the eyes! 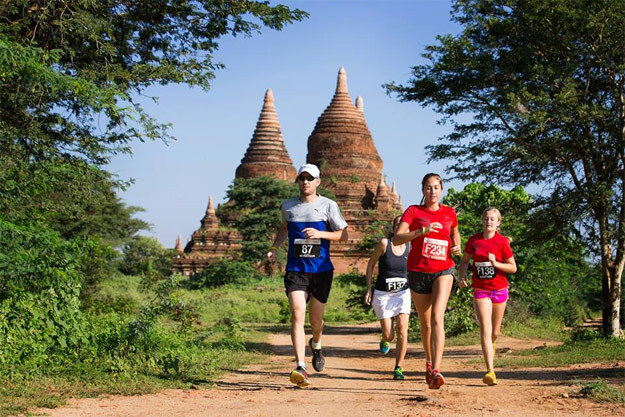 The Bagan Temple Marathon starts at the ancient Htilominlo Temple, which was constructed in 1211AD. 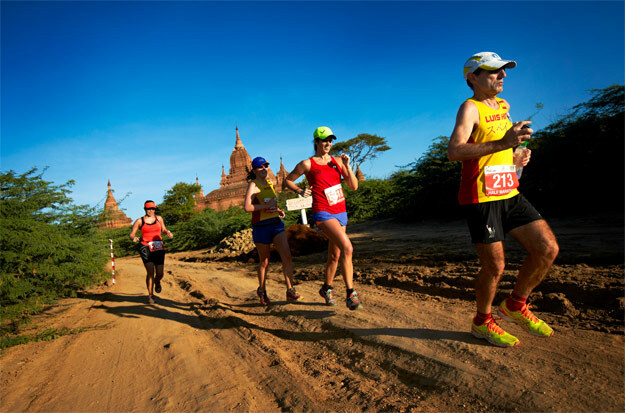 The route takes each runner through Bagan’s wondrous plains where temples can be seen at every angle. As you run through this striking landscape on old dirt roads, the route will take you through traditional villages where locals will cheer you on. The heat and dust of this marathon is a challenge, but the atmosphere as you travel from old to new Bagan is one you’ll be talking about for years to come. See the beauty of Htilominlo Pagoda and more when you spend 3 nights in mystical Bagan on our Hidden Treasures of Burma escorted group tour. Spend 17 memory-filled days exploring untouched Burma. When Cambodia decided to create its first full marathon in 2014, they of course picked the best place for it: Angkor Wat. 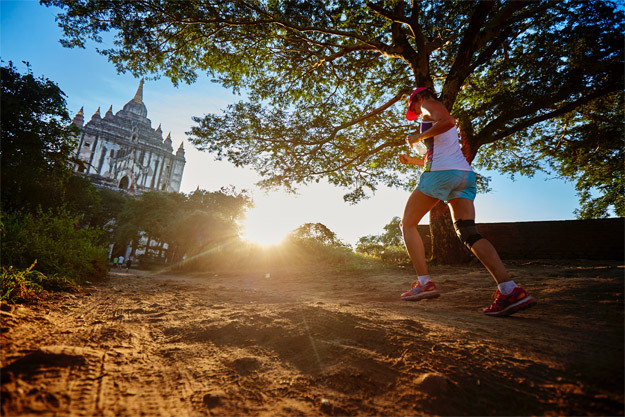 Running a route which takes in many a UNESCO Heritage Site including Angkor Wat, Bayon Temple, Ta Prohm and Pre Rup, this marathon is sure to delight. The race begins and ends at the front of Angkor Wat, and with the race beginning at 4:30am, you’ll get to experience that famous sunrise that everyone always gets up for (as well as miss the heat of the day!). Of all the Asia marathons, it’s a great opportunity to run a personal best as the route is nice and flat. Unless you stop to take some photos of course! What better way to see the world famous Angkor Wat Complex than from the back of a traditional tuk tuk? Discover its magic on our Vietnam and Cambodia Discovery tour. If you’ve already visited Vietnam, then our Around Cambodia escorted group tour spends 15 days exploring solely Cambodia. What better way to experience the views over Halong Bay than by running one of the newest Asia marathons along the coastal route of Vietnam’s most famous sight? 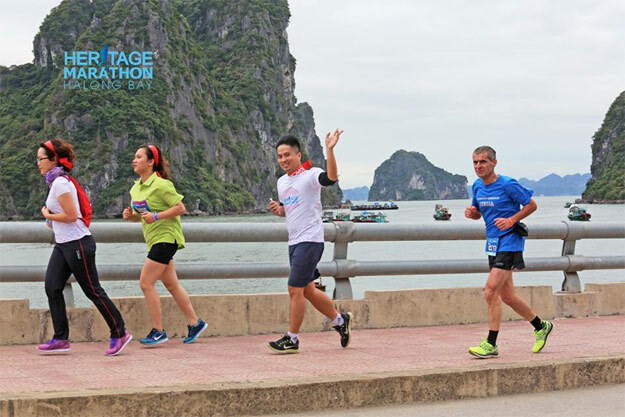 The Halong Bay Heritage Marathon provides incredible views over one of the world’s best natural sights. The route takes you through coastal paths and fishing villages before running over the Bai Chay Bridge, the longest single span bridge in Southeast Asia. The magnificent views will be ones you’ll remember as you cross the finish line on this lush corner of Vietnam. 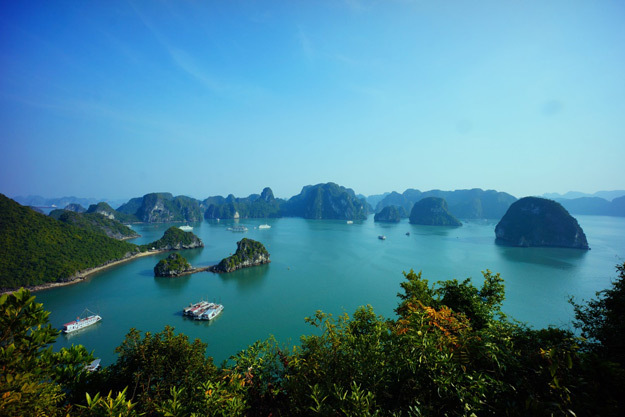 Spend 2 days and 1 night discovering the utter beauty of Halong Bay on our Reflections of Vietnam escorted group tour. Alternatively, our 5* luxury Classical Vietnam escorted group tour spends 3 days and 2 nights cruising along Halong Bay on deluxe boat. Tour Asia a different way with the Asia experts, Wendy Wu Tours. 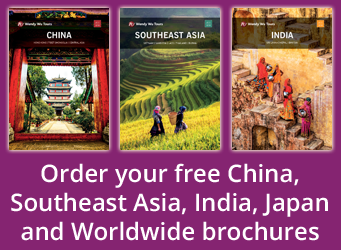 Our fully inclusive, escorted tours to Asia visit all the major sights for an unforgettable holiday. Burma, Cambodia, China, Japan, Vietnam sports. permalink.